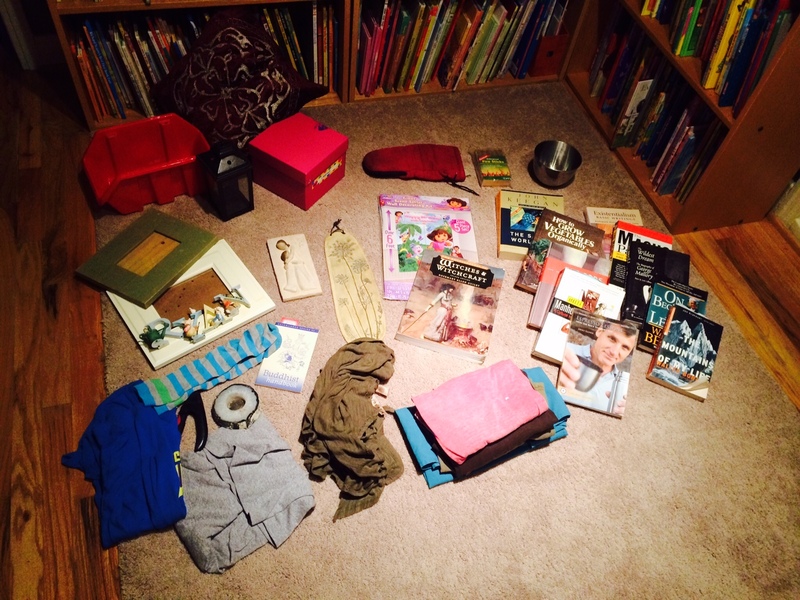 Today was a busy day, but we were able to gather our 16 items. Nothing really exciting made it to the pile, but we managed to purge more things. It’s amazing how many things you can find with a challenge like this. Our book shelves are down to favorites now, so we’re having to look in stored boxes & closets to see what we can let go of. It’s nice to see some space on the shelves. I mentioned to Chris that I’d like to paint the floor downstairs, now that I can actually see it. 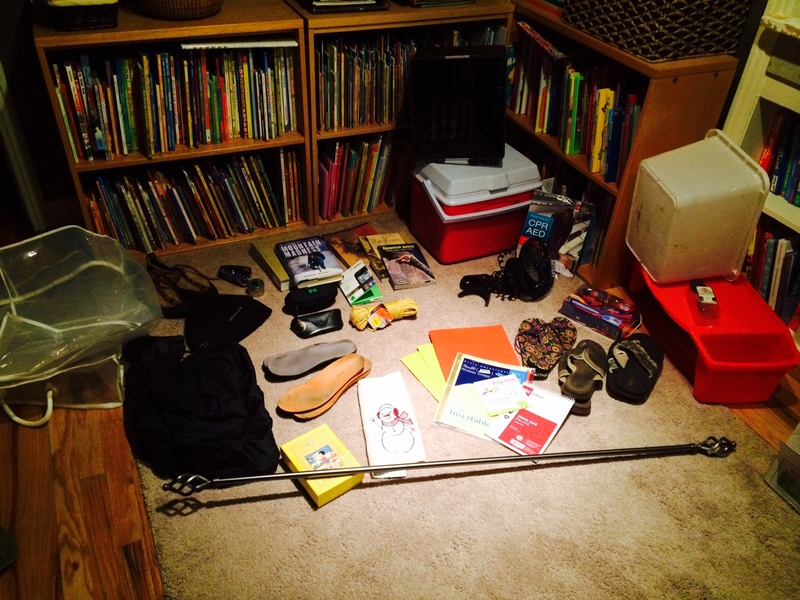 Chris’ items: Clothing, books, yet another keyboard & mouse, magazines & a tool box. Ophelia’s items: clothing, pillows, 2 Moroccan lamps, a ‘fancy’ purse for date nights. Crunch time. At day 12, there’s not a whole lot that you won’t consider purging to make your daily item goal. Today, I purged 2 pillows that I’d been keeping to make covers for (sewing machine required and well,…. ), a bunch of books, a bamboo bowl, 5lb weights, some totally adorable Gustav Klimt cardboard tiles and several pairs of goal jeans (I’ve got a new goal now.) Honestly, I had very little anxiety about purging this pile (Well, maybe a little with the Klimt tiles….) I’m realizing more and more that it’s just ‘stuff’. Chris is still downsizing his bookshelf. 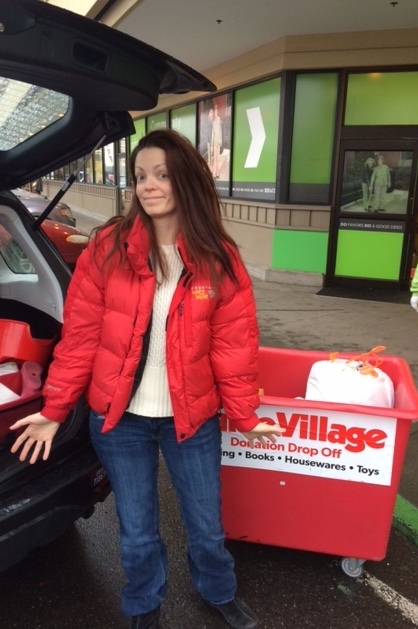 All other items donated to Value Village. Now that we’re in the double digits, we’re feeling the heat. Every day feels like an overhaul of items that we own. What will make the cut? What do we maybe like, but don’t need or use? How far are we willing to go to create an uncluttered space? Apparently, quite far. My items for today include: 2 posters, books, clothing, a scarf, a shelf organizer (I may regret that one), dominoes and a stack of cards. 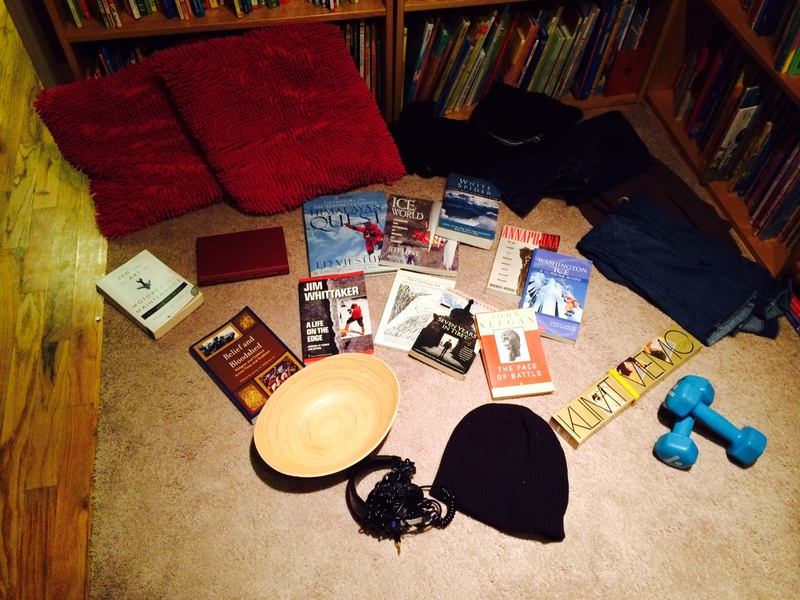 Chris is purging a lot of books for this challenge, so his lot is mostly that. It’s getting a little easier for me to purge my books now. After the first few piles, we’ve created an empty space on the shelf and I’m amused by the void. I almost want to see how far I can push myself with books alone, as I have an deep love for owning books and usually hate to let them go. I remember when I first moved to Seattle from Toronto 8 years ago, I drove all the way to Buffalo just to be able to ship 24 boxes of books here, to avoid having to part with them. It was my “thing” but I think it’s becoming less so now. A few years ago, I picked up a book by Brooks Palmer called Clutterbusting, where he has a chapter on purging books. It’s a simple 3 question list, that you refer to, that makes the whole process easier. There are still many books that I will keep (she says confidently on Day 10), a lot of which are my go-to trauma books and spiritual favorites. But I do see purging quite a few more before the end of the month. Stay tuned. 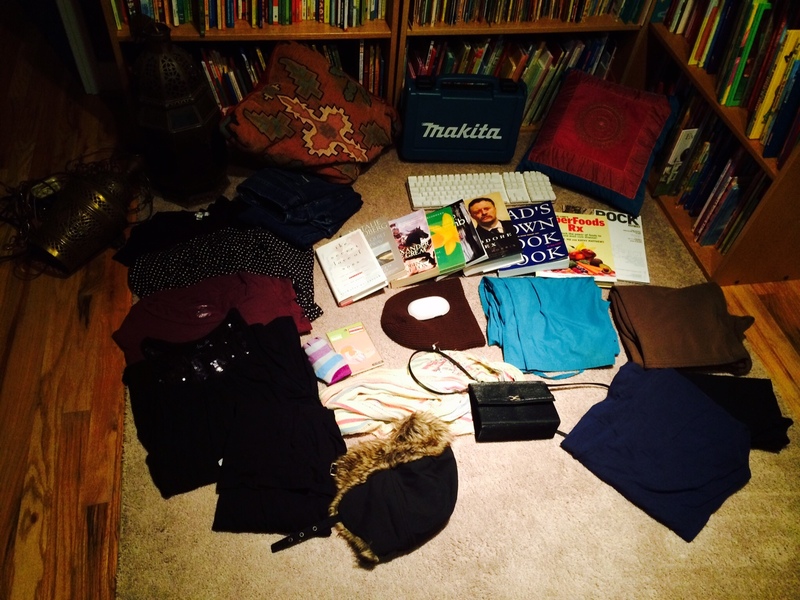 Ophelia’s items: Books donated to Value Village today, with the exception of an abuse documentary and Post-postpartum depression book, gifted to a therapist friend. Chris’ items: More books on masculinity, a herb dictionary and Roman history.